The striker will spend the rest of the season at Livingston after extending his contract. Ryan Hardie has been handed a contract extension at Rangers before returning to Livingston on loan until the end of the season. Hardie has agreed a one-year extension to his current deal, taking him through to the summer of 2020. The forward had enjoyed a loan spell at the Tony Macaroni Arena in the first half of the season but returned to Rangers for the winter break. He worked under manager Steven Gerrard during the squad's warm-weather training camp in Tenerife and impressed the Ibrox boss. However, with Jermain Defoe joining the club and Alfredo Morelos and Kyle Lafferty already ahead of the 21-year-old, he's been allowed to go back out on loan for regular first-team football. "I'm absolutely delighted," Hardie told Rangers' website. "Obviously the first time I was involved this season was the trip to Tenerife, and I was over the moon with that chance to go and show what I can do as it was the first time I had been away with the manager. "When he came in at first, I was injured and I only got playing again at the start of December, so that trip was a chance to show the gaffer what I was about. "He would have seen what I was like from afar, but he just wanted to have a look at me and assess me with a view to next year. Thankfully I have done enough to secure another contract and I am looking forward to kicking on. 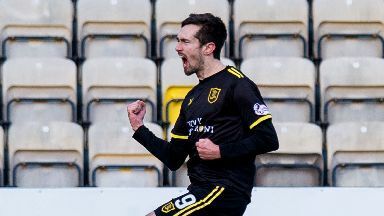 "I have loved it so far [at Livingston] and it is my first experience of starting games in the Premiership and I've managed to get five goals in five games. "So I am looking forward to going there again, scoring more goals and proving I can do it at this level."